IIT Madras is a premier institute in the field of Research & Technology Education. IIT Madras is ranked among the top 10 institutes Engineering Institutes for Research & Teaching by National Institutional Ranking Framework (MHRD) in 2016. The institute offers Undergraduate & Postgraduate Programs in Engineering & Mgt. Education. IITM also offers a chance to pursue Interdisciplinary PhD in exciting areas of research. Candidates with a Master’s degree in Engineering/Technology with a good academic record / Master’s degree by Research in Engineering/Technology with a good academic record / 5 Year Dual Degree in Engineering or 5 Year BS+MS Dual degree from Centrally Funded Technical Institute with a good academic record. 2 Year M.Sc. from IITs (entry through JAM) with 8.0 and above are exempted from qualifying in National Level Exams. Candidates with Master’s degree in Sciences with a good academic record and of exceptional merit are eligible, for the relevant Engineering disciplines (as decided by admitting departments). Candidates must have a valid GATE score or UGC-JRF/NET/CSIR-JRF/NBHM/INSPIRE or equivalent qualification in the relevant area tenable for the year of registration. In the case of candidates with Bachelor’s degrees are in Engineering / Technology OR candidates with more than 5 years relevant experience after the Master’s degree, the requirement of a test score may be waived by the Selection Committee. Master’s degree in Sciences with a good academic record and having a valid GATE score or UGC-JRF/NET/CSIR-JRF/NBHM/INSPIRE or equivalent qualification tenable for the current year in the relevant area. Master’s degree in Engineering/Technology or 5 Year BS+MS Dual degree/ 5 Year Integrated degrees from Centrally Funded Technical Institute are eligible with a good academic record. Students who get more than 8.0 CGPA in M.Sc. in Science Departments of IIT Madras can be admitted directly to their PhD Program in Sciences with interview at departmental level. Master’s degree / dual degree or equivalent in a relevant discipline AND Qualifying UGC – NET or JRF / CSIR-JRF / GATE Score or any national level exam tenable for the current year in the relevant area or international level post graduate admission exam such as GRE (Non-HTRA) OR Master’s degree in Engineering/Technology or 5 Year BS+MS Dual degree/ 5 Year Integrated degree from Centrally Funded Technical Institute with a good academic record. Minimum Educational Qualifications for M.S. Candidates with a Bachelor’s degree in Engineering / Technology with valid GATE score or a Master’s degree in appropriate Sciences/Management where eligible with a good academic record and a valid GATE score or CAT qualification tenable for the current year in the relevant areas. Candidates having Associate Membership of the following professional bodies will also be eligible for admission to the M.S. program of their parent discipline provided they have a valid GATE score and have passed both part A and part B of the Membership exams with a good academic record. IIT B.Tech candidates with a CGPA of 8.0 and above, are eligible to apply for M.S. Program. The minimum eligibility requirement for admission will be graduates with a B.Tech/B.E. or any postgraduate degree (eg. M.A or M.Com will be eligible; not B.A. or B.Com graduate). Bachelor’s degree in Engineering/Technology or a Master’s degree in appropriate Sciences/Management where eligible with a good academic record. Eligible candidates possessing the minimum educational qualifications and satisfying additional and stiffer criteria set by the departments from time to time, will be called for an “test and interview” or only “interview” by the Selection Committees of the respective departments. 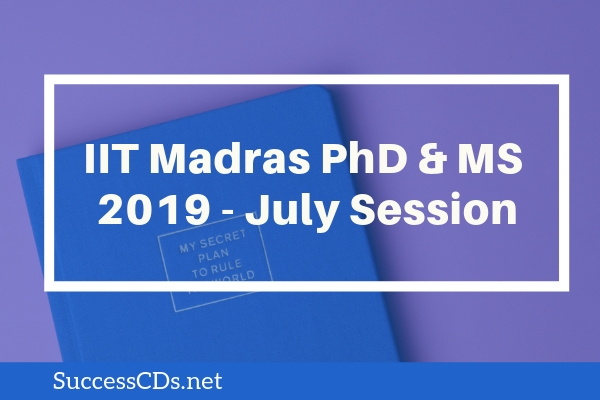 Candidates seeking admission to IIT Madras in PhD /MS Programmes can apply online from the official website at www.iitm.ac.in. Before applying for PhD/MS Programmes, candidates must ensure their eligibility criteria.